Manchester United enjoyed some success from pressing hard during their 2-2 draw with Arsenal at Old Trafford. In a game prophesised by many as Arsenal’s revenge for the 8-2 scoreline in 2011, Jose Mourinho’s team, albeit second best, created a vicious contest by putting pressure on the ball in their 3-4-1-2 system. And ahead of their trip to Fulham, which promises a different kind of intensity, perhaps Man United would benefit from adopting a similar strategy with a slightly more attacking emphasis. 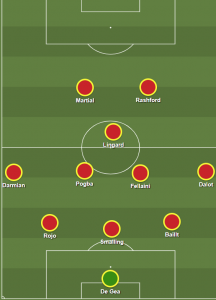 With that in mind, here is how Man United should line up at Craven Cottage on Saturday. It is worth noting that United lost away games to all three promoted teams last season: Huddersfield Town, Newcastle United and Brighton and Hove Albion. In all those games, Mourinho’s team drifted through the game, playing without direction or any notably collective pressing, which invited the opponent forward. Pressing Fulham with the same intensity seen against Arsenal, combined with using Paul Pogba and Marouane Fellaini as more attack-minded midfielers, would surely open up space for Anthony Martial and Marcus Rashford to inflict damage by running in behind Fulham’s back four. Mourinho should not consider changing the front three which linked up well together against Unai Emery’s side.